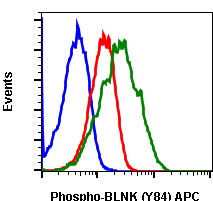 BLNK protein, known as SLP-65 play an important role as adaptor protein in B-lineage cells. 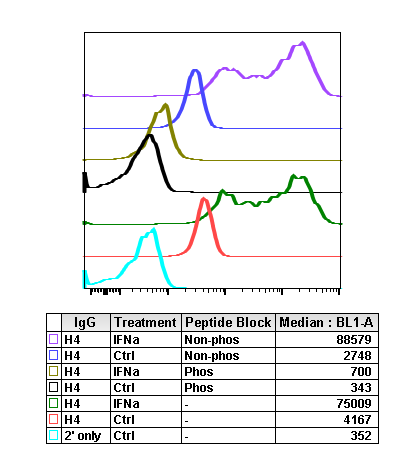 BLNK associates with proteins in the cytoplasmic side of plasma membrane through its N-terminal leucine zipper motif. 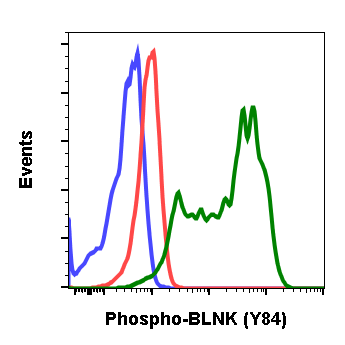 Upon BLNK activation on its tyrosine, BLNK binds to Btk, Vav, Brb2, Syk, and HPK1. 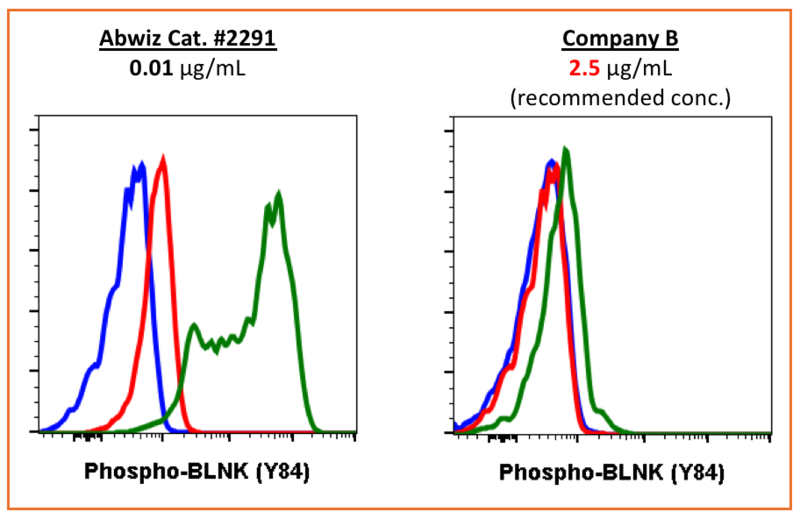 Through this associations, BLNK mediates Ca2+ mobilization, for ERK1/2, JNK and p38 MAP kinase activation. 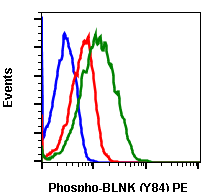 After phosphorylation, BLNK binds Btk and PLCγ2 through their SH2 domains and mediates PLCγ2 activation by Btk. 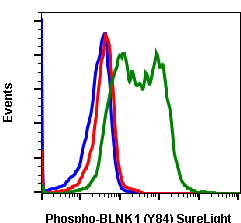 BLNK also binds other signaling molecules such as Vav, Grb2, Syk, and HPK1. BLNK plays aa important role in BCR-dependent progression of B cell development, BCR-mediated B cell survival, activation, proliferation, and T-independent immune responses. Fu, C., et al. (1998) Immunity 9: 93–103. Goitsuka, R., et al. (1998) J. Immunol. 161: 5804–5808. Tsuji, S., et al. (2001) J. Exp. Med. 194: 529–539. 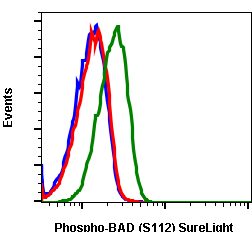 Flow cytometric analysis of Daudi cells secondary antibody only negative control (blue) or untreated (red) or treated with IFNα + IL-4 + pervanadate (green) using Phospho-BLNK (Tyr84) antibody BLNKY84-H4 at 0.01 µg/mL. Cat. #2291. 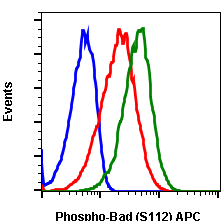 Peptide blocking flow cytometric analysis of Daudi cells secondary antibody only negative control (light blue) or untreated (red) or with IFNα + IL-4 + pervanadate (green) or untreated and blocked with phospho-peptide (black) or treated and blocked with phospho peptide (gold) or untreated and blocked with non-phospho peptide (dark blue) or treated and blocked with non-phospho peptide (purple) using Phospho-BLNK (Tyr84) antibody BLNKY84-H4 at 0.01 µg/mL. Cat. #2291. 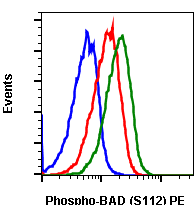 Flow cytometric analysis of Daudi cells secondary antibody only negative control (blue) or untreated (red) or treated with IFNa + IL-4 + pervanadate (green) using 10 ng/mL of Phospho-BLNK (Tyr84) antibody BLNKY84-H4 (Abwiz Cat. 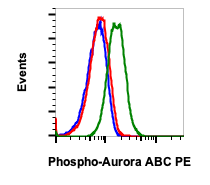 #2291) or Company B antibody at 2.5 ug/mL (manufacturer's recommended concentration).